The idea of loaded guns in beer-soaked frat houses isn't as farfetched as it seems. At least 13 states are considering some form of legislation allowing concealed-carry on campus, according to the National Conference on State Legislatures. . . .
"I would dispute anyone who says there's evidence to suggest that having students carrying guns on campus make our campuses safer," said Steven J. Healy, police chief and public safety director at Princeton University and past president of the group. . . . .
"Only 38% of Dems claim excellent mental health"
When the Gallup pollsters asked Americans what they thought about their own mental health, they were intrigued by the difference between Democrats and Republicans. While 58 percent of Republicans reported having excellent mental health, only 38 percent of Democrats described themselves that way. . . . .
A California court has ruled that several children in one homeschool family must be enrolled in a public school or "legally qualified" private school, and must attend, sending ripples of shock into the nation's homeschooling advocates as the family reviews its options for appeal. The ruling came in a case brought against Jonathan and Mary Long over the education being provided to two of their eight children. They are considering an appeal to the state Supreme Court, because they have homeschooled all of their children, the oldest now 29, because of various anti-Christian influences in California's public schools. The decision from the 2nd Appellate Court in Los Angeles granted a special petition brought by lawyers appointed to represent the two youngest children after the family's homeschooling was brought to the attention of child advocates. . . . It may make sense that certain public displays of affection should be off limits for junior high students, but a ban on hugs? It has come to that at an Arizona school district, where administrators are taking a hard line on student-to-student embraces, MyFOXPhoenix.com reports. Mesa Public Schools always had rules against public displays of affection by students, but the administrators recently took additional steps to remind students what types of hugs and other activities, such as kissing, are unacceptable, according to MyFOXPhoenix.com. "We really don't want students having inappropriate behavior in the hallways," Kathy Bariess, a school administrator, told the TV station, which reports that students who hug longer than two seconds will be broken up. Parents are split over the school district's policy, while students at Shepherd Junior High School staged a protest over the hugging ban. Legislation to end gun free zone on Arizona campuses draws fire. KINGMAN - Several state senators want a bill passed that allows college students to carry guns on campuses. Four Republican members of a Senate Judiciary Committee, including Sen. Ron Gould, R-Lake Havasu City, voted to pass along legislation that would allow people with a concealed weapons permit to carry a gun onto Mohave Community College, Northern Arizona University and the other community colleges and universities in the state. The three Democrats on the judiciary committee voted against the proposed legislation. The Senate bill, SB 1214, now goes to the Senate Rules Committee. The bill had included all schools, including elementary to high schools, but the bill was revised for colleges only. . . . .
. . . Iowa state Rep. Clel Baudler, R-Greenfield, a ranking member of the House Public Safety Committee, hopes to bring a house file with about 40 co-sponsors into a vote to change Iowa Code. The bill also would set a standard for gun training across the state for those seeking concealed-weapons permits. . . .
[Dubuque County Sheriff Ken Runde] cited permit-issuance statistics and said, "I talk to each individual person who applies for a permit. If they tell me (a concealed weapon) is needed to take money to the bank and for their business, then I give it to them for that reason. 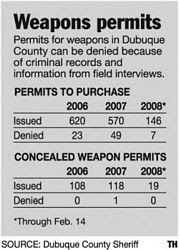 But I just won't give you a concealed-weapon permit if you think your neighborhood is unsafe. . . .
Dubuque appears to be one of the most restrictive counties in the state and the sheriff opposes making the process more objective. I guess I would think that it is not just money that is worth protecting. Poorer people in unsafe areas, not just wealthy businessmen who carry a lot of cash, also deserved protection. McCain when asked about his age: First I am accused for having an affair with a woman thirty years my junior, NOW you are telling me I am too old? Obama lying to voters about his position on NAFTA? Talking Points Memo points us to a new report from Canada's CTV in which the news organization fingers Austan Goolsbee, Barack Obama's chief economic advisor, as the man who told Canada not to worry about Obama's anti-NAFTA rhetoric. According to CTV, the conversation between Goolsbee and the Canadian consulate general took place in Chicago. CTV also reported that on Thursday night "CTV spoke with Goolsbee, but he refused to say whether he had such a conversation with the Canadian government office in Chicago. He also said he has been told to direct any questions to the campaign headquarters." Having been apprised of this information, How the World Works feels it should retract its unsourced suggestion that this whole affair smelled like a political dirty trick. Goolsbee's refusal to affirm or deny that the conversation took place, the Obama campaign's original cautious response that "the story was not accurate" and the likely fact that Goolsbee almost undoubtedly believes that Obama's vigorous criticism of NAFTA is indeed just rhetoric, make the story a good bit more believable than it first appeared. One doubts that this was an authorized communication between the Obama campaign and the Canadian consulate, however. . . .
Canadian TV also reported on this Wednesday, becoming possibly the first news organization to do so. If that is true, I would guess that the story came from the Canadian government. Now the Obama campaign may really be making a mess of all this by changing their statements on all this. You can listen to the interview about multiple victim shootings here. The discussion was not balanced in terms of time (out of the 26 minutes the other side got 16 minutes and they wouldn't let me respond at the end), but I still think that I held my own here. UPDATE: Sorry about the link not working originally. John Tierney has another interesting post about how much carbon dioxide gets produced from people walking instead of taking a car. Guess what? "Food production creates carbon emissions." Who would have guessed? Anyway, next time someone gives you a hard time for driving your car just tell them that you are doing what you can to save the planet. Obama's rating from the National Taxpayer's Union is only 6 percent in 2005 and 16 percent in 2006. Ted Kennedy received a 7 percent in 2005 and 10 percent in 2006. A score closer to zero means the politician voted for more spending, while a score closer to 100 means the politician voted against more spending. By comparison to Clinton, Edwards and Kucinich, Obama supported more government spending than any of them. On the Republican side, McCain got a 78 percent in 2005 and 88 percent in 2006. AUSTIN - Democratic presidential candidate Barack Obama strayed onto Republican turf in Texas, agreeing Thursday with a core GOP principle: Be conservative when it comes to federal spending. . . .
How can Obama think that anyone will seriously view Obama as a conservative on government spending. We leave our most vulnerable population open for target practice. As the disturbing stories pile up as high as the dead bodies at the site of a massacre, as we become more aware that most of the mass killings of late across the nation ended not with the death of the killer by an avenging civilian angel or police officer, but by suicide, the no-guns ethos begins to look somewhat ridiculous. . . .
Houston (Reuters) - A drop in wind generation late on Tuesday, coupled with colder weather, triggered an electric emergency that caused the Texas gird operator to cut service to some large customers, the grid agency said on Wednesday. Electric Reliability Council of Texas (ERCOT) said a decline in wind energy production in west Texas occurred at the same time evening electric demand was building as colder temperatures moved into the state. . . .
Obama tried to imagine himself in different roles. He considered becoming president of the Joyce Foundation, a Chicago organization that gives out roughly $50 million a year to initiatives on the environment, poverty, violence, and schools. The position was high-profile, well paying, close to home, and appealed to his sense of public mission. Obama knew the foundation's work because he was on its board at the time. . . .
Leyde couldn't believe it when he scratched a winning ticket, but he still plans to return to Iraq. . . . While I think Stossel does a great job, I would have been a little stronger on some of the issues here. I wish that Stossel would have clearly pointed out that all these MVPS with more than a few people killed are occurring in gun few zones. In fact, the general election could begin as early as next week if Mrs. Clinton loses the big March 4 primaries and drops out, and it could be a sizzler. A new Los Angeles Times/Bloomberg poll released yesterday shows Mr. McCain holding a slight lead over Mr. Obama (44% to 42%), though the result is well within the survey's margin of error. That Mr. McCain puts up such a strong showing ought to worry Democrats, especially since the political atmospherics continue to favor their party this year. Even more worrisome, however, are the poll's internal findings, which show that although Mr. McCain is not necessarily conservatives' choice for president, he might be the best choice for Republicans. Those troubling signs for Democrats include the following: When it comes to independent voters, Mr. McCain more than holds his own with Mr. Obama (41% to 39%); on the question of who could best manage the economy, which a plurality of respondents consider the most important issue, Mr. McCain holds an eight-point lead (42% to 34%); on the question of leadership, Mr. McCain has a six-point lead; on illegal immigration, Mr. McCain has an 11-point lead (40% to 29%); on Iraq, Mr. McCain has a 13-point lead (47% to 34%); on protecting the country from terrorism, Mr. McCain has a 37-point lead (58% to 21%); and on the question of experience, Mr. McCain has a 31-point lead (53% to 22%). The poll's news isn't all bad for Mr. Obama. He beats his potential rival on health care (44% to 30%) and on the question of which candidate would change the way things are done in Washington (55% to 20%). The two candidates split evenly on the question of integrity and honesty -- not a bad result for Mr. McCain, considering he's a veteran politician who has haunted the corridors of power for more than two decades. . . .
Nearly three out of four Americans — 73% — believe the Second Amendment spells out an individual right to own a firearm, according to a USA TODAY/Gallup Poll of 1,016 adults taken Feb. 8-10. . . .
Lower court judges overwhelmingly have ruled that the right "to keep and bear arms" isn't for individuals, but instead applies to state militias, such as National Guard units. The U.S. Supreme Court repeatedly declined to hear appeals of those rulings, fueling the debate over gun control and tension between the law and public opinion. . . . Neither Hillary Clinton nor Barack Obama has focused on gun control in their campaigns for the Democratic nomination. When asked specifically about it in public forums, they voice modest support for new regulations and quickly add that the Second Amendment protects people's gun rights. "The Clinton and Obama campaigns know the public opinion data on the issue well," says Karlyn Bowman, a senior fellow specializing in public opinion polls at the American Enterprise Institute. "Opinion is complex, but the right to be able to own a gun seems to be firmly held, and I think that's why both candidates say what they say." At a debate in January, Clinton acknowledged that she had dropped her support for the licensing of new gun owners and registration of new guns, which she advocated in 2000 when she ran for the U.S. Senate in New York. She endorsed reinstating an assault-weapons ban, then added: "I believe in the Second Amendment. People have a right to bear arms. But I also believe that we can common-sensically approach this." Obama also said he no longer supported broad licensing and registering of firearms, as he did when he was in the Illinois Senate. "We essentially have two realities when it comes to guns in this country. You've got the tradition of lawful gun ownership. … And it is very important for many Americans to be able to hunt, fish, take their kids out, teach them how to shoot," he said. "And then you've got the reality of public school students who get shot down on the streets of Chicago.". . .
What type of judges would Obama appoint? Terence Jeffrey discusses the issue here. I have a hard time believing that the next president will make fewer than two appointments to the Supreme Court. Legislation to block the public from records of Virginians with permits to carry concealed handguns has died. The Senate Courts of Justice Committee voted 9-7 Monday to carry the bill over until next year. Republican Delegate Dave Nutter's bill originally would have prohibited access to a state police database of permit holders. The House added a provision allowing Circuit Court clerks to release only the names of permit holders while keeping all other identifying personal information secret. . . .
Last year The Roanoke Times posted the state police database on its Web site. Attorney General Bob McDonnell advised the state police to stop making the list available, but Nutter said any Circuit Court judge could overrule McDonnell's opinion. . . .
Today's New York Times takes up the obvious waffling that Obama is now doing on his campaign finance proposals from last year. Now his challenge to his rivals has boomeranged into a test of Mr. Obama’s own ability to balance principle and politics in a very different context. After taking in $100 million in donations, Mr. Obama is the one setting fund-raising records, presenting a powerful temptation to find a way out of his own proposal so that he might outspend his Republican opponent. And the all-but-certain Republican nominee, Senator John McCain, is short on cash and eager to take up the fund-raising truce. . . .
For balance it would have been nice if the NY Times had mentioned that the agreement was entered into by McCain when McCain was the lead Republican in the polls and doing very well raising money. As it is, Obama would still have a significant advantage over McCain if he took public financing because the Republican convention is so much earlier than the one for the Democrats and at that time you have to stop using privately raised money and start using the $85 million from public financing. They argue that Mr. McCain may have violated technicalities of the election laws by using his eligibility for public matching funds to help obtain a loan but then opting out of the matching funds at the last minute to avoid the spending restrictions they impose. “People aren’t exactly clear whether all the t’s were crossed and i’s were dotted,” Mr. Obama said in Tuesday’s debate. (The McCain campaign said it followed the law.) . . .
As McCain's side said, they have an argument that indeed they followed the law so I don't know where all this is going to end up. Personally, however, I would like to see Obama argue against the public financing of campaigns. Mr. Obama has argued that his campaign was already meeting the spirit of public financing laws because it had relied overwhelmingly on small donors instead of corporate patrons. . . .
Ironically, Obama has been running into new claims regarding money that he has recently received see here. Mr. Obama appeared to set some new conditions. He argued that any bipartisan agreement to accept the limits of public financing would be “meaningless” if there were no provisions to close the “loopholes” that allow unlimited spending during the long primary season or by independent outside groups. . . .
What I have been arguing for years is that there are always "loopholes" in these laws. The number of loopholes are countless and if Obama is going to argue this it is a sure fire way to ensure that no agreement will ever be reached. It is not clear how either of these pieces of legislation would have had anything to do with stopping the attack at Northern Illinois University. But I suppose that is not unusual. SPRINGFIELD - Proposals that would ban semi-automatic assault weapons and outlaw the purchase of more than one handgun a month cleared an Illinois House committee on Wednesday. Rep. Edward Acevedo, a Chicago Democrat, sponsored House Bill 4357, which would would ban the sale or purchase of semi-automatic assault weapons, assault weapon attachments, .50-caliber rifles or .50-caliber cartridges. . . .
Who knows what they are defining "assault weapons" as here. There were just standard pistols. Given that the attack didn't use these very heavy, large, and expensive .50-caliber guns, it seems obvious to include them here. 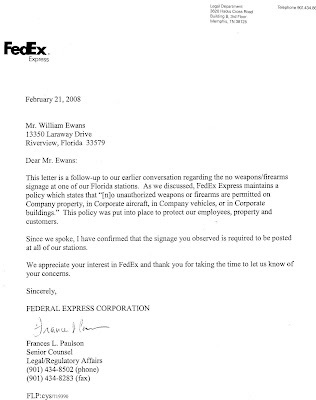 Well, I believe that Fedex doesn't have this sign in many states that they can't restrict permitted concealed handguns (Virginia and Pennsylvania), and I assume that they have had no problems in any of those locations. It is not clear why they should ban permitted concealed handguns in Florida. Thanks to William Ewans for sending this to me. Wearing bandanas around their faces, several assailants believed to be students from the University of California at Santa Cruz on Sunday attacked the home of a researcher who uses mice to study breast cancer. . . .
Gun-toting toll collectors have been stripped of their sidearms by Mass Pike brass after secretly carrying them for decades without formal training, the Herald has learned. But union officials said they are going to fight to allow the toll collectors to keep their weapons, even though a Pike review found the guns were not being properly maintained, with firing pins misaligned and other problems. . . .
As usual, the Times editors seem unaware of how silly their argument is. To them, the choice is between "carefully controlling guns" and "arming everyone to the teeth." But no one favors "arming everyone to the teeth" (whatever that means). Instead, gun advocates favor freedom, choice and self-responsibility. If someone wishes to be prepared to defend himself, he should be free to do so. No one has the right to deprive others of the means of effective self-defense, like a handgun. . . .
was stolen in the mid-1990s from Franklin County, police said Wednesday. St. Louis County police spokeswoman Tracy Panus said the investigation into the gun's history since 1994 or 1995 is ongoing, and she could not provide any further details. . . .
"Sponsors of bills that would require coding of cartridge casings and bullets in their respective states have neglected to mention that there is only one company in the country with the technology, and that company has been working with a 'hired-gun' consulting firm that offers its help to lawmakers drafting the legislation," Gottlieb said. "Essentially, you have state legislators working as promoters for a company called Ammunition Coding System, pushing measures in at least ten states that would mandate the use of this proprietary technology at the expense of gun owners. "Even if the technology were licensed to various ammunition manufacturers," he continued, "it still puts one company in a monopoly position. On its own website, the company even acknowledges that legislation would be required to implement what many gun owners believe is a back-door gun registry, by forcing dealers to keep records on who purchases ammunition. "Creating a technology, and applying for a patent while hiring a consulting firm to push legislation that requires this technology is horribly self-serving," Gottlieb added. "The fact that in every state these measures are being pushed, the sponsors are anti-gun lawmakers, simply adds to the suspicion. "Giving one company a legislated monopoly in any other area would bring down a media firestorm," Gottlieb stated. "The government would never allow it. State senators, representatives or assemblymen who get involved with this effort should ask themselves just what it's worth to essentially be lobbyists for a monopoly." Obviously, Buckley had a big impact on the United States. He will be missed. There is only one little problem with this entertaining film: temperatures had started falling in the late 1930s and continued falling until the late 1970s. This film at least has the amusing title of "The Unchained Goddess." Possibly the problem isn't that they aren't right at the margin, but that the impact from man is so small that it doesn't really alter these overall patterns very much. I am pretty sure that I have seen this before, possibly as a kid in the late 1960s. Although interagency agreements between NWS and FAA state that both agencies have responsibilities for assuring and controlling the quality of aviation weather observations, neither agency consistently does so for weather products and services produced at the en route centers. Specifically, neither agency has developed performance measures and metrics, regularly evaluated weather service unit performance, or provided feedback to improve these aviation weather products and services. Because of this lack of performance tracking and oversight, NWS cannot demonstrate the quality or value of its services, and FAA cannot ensure the quality of the services it funds. Until both agencies are able to measure and ensure the quality of the aviation weather products at the en route centers, FAA may not be getting the information it needs to effectively manage air traffic. Private weather services have said that they would be happy to provide weather service predictions "at a lower cost than currently provided" by the NWS. Global temperatures had stopped rising over the last decade, and now they may be falling. 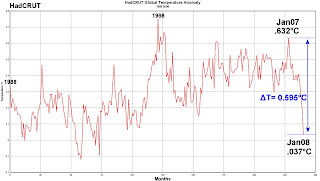 Twelve-month long drop in world temperatures wipes out a century of warming . . . .
Meteorologist Anthony Watts compiled the results of all the sources. The total amount of cooling ranges from 0.65C up to 0.75C -- a value large enough to erase nearly all the global warming recorded over the past 100 years. All in one year time. For all sources, it's the single fastest temperature change ever recorded, either up or down. . . . .
For those obsessing on this already, you can find the information here. Right now McCain is slightly ahead in terms of the popular vote, but behind 284 to 216 in terms of the electoral vote. The Maine study, which shattered 65 bulbs to test air quality and clean-up methods made these recommendations: If a bulb breaks, get children and pets out of the room. Ventilate the room. Never use a vacuum -- even on a rug -- to clean up a compact fluorescent light. Instead, while wearing rubber gloves, use stiff paper such as index cards and tape to pick up pieces, then wipe the area with a wet wipe or damp paper towel. If there are young children or pregnant woman in the house, consider cutting out the piece of carpet where the bulb broke. Use a glass jar with a screw top to contain the shards and clean-up debris. “We found some very high levels (of mercury), even after we tried a number of clean-up techniques," said Mark Hyland, Maine director of the Bureau of Remediation and Waste Management. During several of the experiments, for example, he said mercury in the air was more than 100 times levels considered safe even after a floor was cleaned. He said such levels would quickly decline if the room were ventilated and people followed their tips. They said most danger could be avoided if people exercised common-sense caution, such as not using the bulbs in table lamps that could be knocked over by children or pets and properly cleaning up broken bulbs. Here are a couple of questions: How do the pennies that you save with these bulbs compare to the time and health costs of dealing with them? Remember you have to keep these bulbs on for at least 15 minutes once you turn them on (rather inconvenient if you ask me). So what bulbs are we supposed to use in table lamps or those lamps that can be knocked over? Of course, in other posts I have mentioned some of the other costs from these "efficient" bulbs. A former police officer convicted of murdering his girlfriend and their unborn child tearfully apologized to her family Monday in front of the jury that will decide whether he lives or dies. Bobby Cutts Jr. weeps openly as his mother describes his childhood during a sentencing hearing. "It was a nightmare that will continue to haunt me for the rest of my days," said Bobby Cutts, Jr., 30, reading from a prepared statement at the penalty phase of his murder trial. "Ladies and gentlemen of the jury, I'm asking you to spare my life." . . .
"Columbine To Va. Tech To NIU: Gun-Free Zones Or Killing Fields?" The previous Thursday, five people were killed in the city council chambers in Kirkwood, Mo. There was even a police officer already there when the attack occurred. . . .
Ferrum College canceled classes and went on lockdown Tuesday as police searched for a suspicious person on campus. A Franklin County Sheriff's Department spokeswoman said college President Jennifer Braaten activated an alert system and ordered the lockdown after receiving reports of a suspicious male on the campus. Classes were canceled for the day. . . .
No shots have been fired and there have been no injuries. OK, the fact that Sienna Miller "loves" guns may do more to make gun ownership "cool" than any thousand columns that I could write. Sienna says: "But the best bit is that I'm doing that gun-twisting stuff. I'm learning how to shoot properly, and it's all cool and a lot of fun." On Feb. 9, Oakland police, led by state Sen. Don Perata, D-Oakland, offered to buy handguns and assault weapons for $250 each, “no questions asked, no ID required.” The “One Less Gun” buy-back program attracted so many eager sellers that the money quickly ran out. But instead of closing up shop, the police handed out IOUs good for a future buy back. The Oakland police are now stuck with a bill for $170,000. On the contrary, the buy back was a bad idea from the beginning. Gun buy backs have been tried before, in cities from Seattle to Washington, D.C., and they simply don’t work. . . .
NewScientist.com lets us know that the earth will indeed burn up in a ball of fire, just not due to increased carbon dioxide. There is one last hope for anybody still living on Earth, the researchers say. In the past, some have suggested that Earth’s orbit could be tweaked by arranging the fly-by of a nearby asteroid to tug at it. This method could potentially maintain Earth’s speed enough to keep it in a widening orbit, they say. . . .
Is the "high price" of everything from coffee in restaurants to popcorn in movie theaters due to monopoly power? Prices for goods such as blades for razors, ink for printers and concessions at movies are often set well above cost. This paper empirically analyzes concession sales data from a chain of Spanish theaters to demonstrate that high prices on concessions reflect a profitable price discrimination strategy often referred to as metering price discrimination. Concessions are found to be purchased in greater amounts by customers that place greater value on attending the theater. In other words, the intensity of demand for admission is metered by concession sales. This implies that while some consumers' surplus may be reduced by the high concession prices, surplus of other consumers on the margin of attending may increase from theaters' decisions to shift their margins away from movies and toward concessions. First as a side note, most theaters, at least in the US, do not prevent people from bringing in concessions with them to the theater (I don't know about Spain), and that is at least inconsistent with the monopoly type story. It is also interesting to note that these claims about above marginal cost pricing are made for many similar product such as wine in restaurants or coffee or the differences between lunch and dinner prices, and it is hard to believe that monopoly power actually explains the "high prices" in all these cases. Russell Roberts and I provided a cost based explanation for all the phenomenon back in 1991 here. I guess that my biggest question is what else would one expect relating the log(concession revenue) with log(attendance) and Box Office revenue per attendee. Concession revenue goes up with attendance (though at a lower rate than attendance revenue -- congestion) and it goes up with box office revenue per attendee (presumably picking up the fact that higher revenue per attendee means fewer old people and very young people). What is the problem here and why is price discrimination the only answer here? By the way, when they run a regression that includes information on the number of screens and seats per screen (Table 2, specification 2), those two variables really explain all the variation in popcorn prices (something akin to the hypothesis that Russell and I advanced). I am also not clear why logs are used for concession revenue and attendance, but not box office revenue per attendee. China is surviving its most brutal winter in a century. Temperatures in the normally balmy south were so low for so long that some middle-sized cities went days and even weeks without electricity because once power lines had toppled it was too cold or too icy to repair them. . . .
As the rhetoric in Frankfort rolled to a boil, Kentucky's public universities expressed solid opposition Wednesday to a bill that would allow people to bring firearms onto campuses as long as the weapons remained in vehicles. In Frankfort, state Rep. Kathy Stein, chairwoman of the House Judiciary Committee, said the bill amounts to "micromanaging" institutions of higher education, and the legislation is unlikely to get out of her committee for a vote in the full House. "Meddling in the affairs of the universities and community and technical colleges is not high on our list of priority issues," Stein said. That infuriated the bill's sponsor, Rep. Bob Damron, D-Nicholasville, who said he plans to step up his work to force the bill past Stein, whom he labeled a "gun-control Sally." Damron said he thinks he now has more than 50 co-sponsors and could win if Stein doesn't block House Bill 114. The Jessamine County lawmaker, who is not on the Judiciary Committee, predicted his bill could get approved by 10 of the 15 committee members and would pass on the House floor 85-15. He declined to identify the members who would vote for the bill but said the list of co-sponsors gives a clear indication of overwhelming bipartisan support. . . .
Michael Barone has a very interesting article today on how Democrats allocate delegates. What I found most interesting is how districts have an equal number of delegates and the number isn't large so that even if one of the candidates wins the district by a significant percentage both candidates still win the same number of delegates. You can win all the congressional districts and not pick up any more delegates from those allocated by congressional district. Barone's suggestion is to at least have an odd number of delegates so that a winning candidate at least picks up a net gain of one delegate. ALBANY, Ore. — A pair of Albany teenagers suspended for "gang-related behavior" because they were wearing crucifixes say they were only wearing gifts from their mothers. Jaime Salazar, 14, his friend Marco Castro, 16, were suspended from South Albany High School recently after they refused to put away the crucifixes they were wearing around their necks. . . . I suppose what caught my notice in this New York Times piece is that kids had become terrified of driving. The caption under the picture reads: "Kelsey Sheffer, 16, of Bethlehem, Ga., says she lost the motivation to pursue a full license after she saw accident sites with a police officer. For now, her mother is happy to shuttle her around." It is true that youth have had higher accident rates, but you get some rough idea of the risk from the higher insurance premiums: "it now costs 80 percent to 100 percent more to add a 16-year-old to a family’s auto policy." The lack of subsidies for Driver's Ed training (with many schools no longer subsidizing the training) is also mentioned as a reason for the drop. I think that what bothers me most about the tone of the piece is the lack of understanding of trade-offs. Surely, reducing accidental car deaths is good, but it is not the only consideration. There are benefits to teenagers driving, just as there are benefits to adults driving. What is the cost in parent's time driving their kids around? What are the forgone opportunities of the kids because they can't be involved in certain activities? This seems like one topic that could benefit from some rigorous research. Many national politicians, including Clinton, have moved toward the center over time. But Obama’s transitions are still quite fresh. A questionnaire from his 1996 campaign indicated more blanket opposition to the death penalty, and support of abortion rights, than he currently espouses. He spoke in support of single-payer health care as recently as 2003. . . .
Crime as a big issue in campaigns this year? 1,139 Americans in December which threat they took most seriously, 69 percent chose violent crime and only 19 percent named terrorist attack. The survey was part of a striking report released Saturday (Feb. 23) by Third Way, a liberal think tank, and several governors, warning that the crime issue, which has slipped off the political agenda since its heyday in the 1970s and 1980s, is about to return. "Four new and dangerous sociological trends are converging to disturb the peace and are threatening a crisis of crime, if not addressed," says the report. . . . Possibly it is because of misleading claims put out by places such as the Police Executive Research Forum (for my discussion of this see here). Yet, the most recent numbers indicate that all cateogries of violent crime were falling for at least the first half of last year and that crime rates have been falt during this decade. Except for the news coverage of this, it is very hard to see where these fears are coming from. Things are certainly no worse off than a few years ago when there was no similar concern about crime rates. The average Conservative supporter is driven by policies, hordes of Liberals vote by rote and tradition, and leadership is barely a factor in the current popularity of any of the federal parties. Sounds preposterous? You bet it does. But those are among the results of a stunning new Nanos Research-Sun Media public opinion poll that turns conventional wisdom on its head, and is guaranteed to cause more than a little shock and awe among the chattering classes. This is no rogue survey. Pollster Nik Nanos is arguably the most respected in the country, having accurately predicted the outcomes of the last two federal elections within a decimal point. . . .
Conservative suspicion that masses of Canadians don't care about Dion's disastrous leadership; they would vote for the Liberal party led by a fencepost. . . .
Ralph Nader announces that he is running for the Presidency, but how much more left-wing can Nader be than Obama (who has the most liberal voting record in the Senate). My guess is that despite the hard feelings towards Nader after the 2000 election he could still create problems for the Democrats because of the war. Both Obama and Clinton seem to have signed on to letting the troops stay in Iraq if the generals say that they should stay their longer. WASHINGTON (AP) –Ralph Nader is launching a third-party campaign for president. The consumer advocate made the announcement Sunday on NBC’s “Meet the Press.” He says most Americans are disenchanted with the Democratic and Republican parties, and that none of the presidential contenders are addressing ways to stem corporate crime and Pentagon waste and promote labor rights. As I waited in the parking lot for the doors to open at 9 a.m., two guys pulled up next to me in a black Chevy pickup. They wore camo ball caps, jeans and sweat shirts. Nothing unusual there - until one slung a rifle over his shoulder as they headed for the door. Anywhere else, people would grab their cell phones and dial 911. But this was the Pro Gun Show at the Roberts Centre in Wilmington. Dozens of guys were toting shotguns, rifles and handguns, not to mention swords and knives. It looked like a not-very-well regulated militia from Red Dawn, reporting for duty. As the line spilled out the door, each gun was carefully inspected and tagged to certify that it was unloaded, and safe to sell or swap. "No cameras," said a sign. It occurred to me that I could get kicked out for carrying a Kodak, but nobody would blink if I flashed a Glock. Apparently, gun owners and dealers value their privacy. . . .